SpaceX CEO Elon Musk has announced an intriguing potential side effect to his efforts to create a permanent, self-sustaining human presence on Mars. Musk told an audience at the International Astronautical Congress that he plans to use rockets to allow anyone to travel around the world in under an hour for the same cost as a traditional flight. The entrepreneur’s idea for what he calls the BFR (short for Big F***ing Rocket, not kidding) will also be used to launch a manned mission to Mars in 2024. Musk said he plans to refocus SpaceX’s efforts to work on development of the rocket, which will be the basis for all of its future missions. 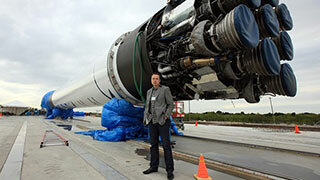 The entrepreneur claims the rocket will be able to fly people anywhere in the world in under an hour, with flights from New York to London taking 29 minutes, and London to Sydney taking 51 minutes. He later added on his Instagram account that “cost per seat should be about the same as full fare economy” in a traditional aircraft. SpaceX has made headlines in recent years with its successful missions to return its Falcon 9 rockets to landing pads after launch. Watch Musk’s full presentation here.